Fees include student textbooks, study guides, ASA exam & ASA certification. For all overnight cruising classes (104, 106, & 108), fees also include on board provisions. Not included are any on shore meals. Take advantage of our stay aboard policy for 101 and 103. See the details on our class description page. To register and pay just click on any of the Register Now buttons, complete the registration form and pay through PayPal using your PayPal account or credit card. Thank you! After completing the 104 level, you’ll be able to bareboat charter with most charter companies in the US, the Caribbean, and many other locations around the world. To register for a clinic go to the ASA website instructor clinic schedule tab or after Feb 28, 2019 call/email R&R Charters and Sail School directly! 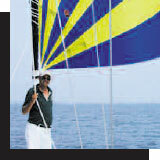 R&R Charters and Sail School will assign any appropriate certified instructor, who is available, to teach each course! If a student wishes to request a specific instructor, that student will need to have a flexible schedule and pay an additional $100. Otherwise, we cannot guarantee the requested instructor. All fees are due upon registration. If the student should cancel, there is no refund.